Introducing the “Super Rootvol LS Mirrors Creator” or SRLMC for short! Creating load-sharing mirrors of the Data SVM’s rootvol - where the Data SVM serves NAS protocols - has been a NetApp best practice from pretty much year dot of Clustered DataONTAP (or ONTAP). It’s often arguable whether they’re really needed, and they can be a bit of a pain, but this blog post isn’t the place to go into the debate. - It will prompt for cluster, username, and password. - It does the usual, load DataONTAP PowerShell Toolkit, and connects to the cluster. - It acquires the nodes in the cluster. - It acquires the data aggregates in the cluster. - If any node does not have a data aggregate, it exits! - It automatically selects the first acquired data aggregate per node to be used for the LS Mirror volumes. - It acquires all the running NAS data SVMs, and their root volume information. 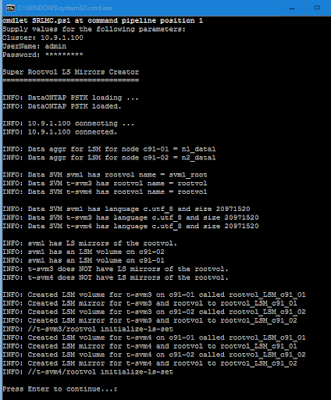 - Then it goes ahead and creates LS Mirrors for the rootvol, for all the NAS data SVMs. - If a data SVM already has LS Mirrors, it does nothing for that data SVM. "`nSuper Rootvol LS Mirrors Creator"
"INFO: DataONTAP PSTK loading ..."
"INFO: Data aggr for LSM for node $Node = $Aggregate"
"INFO: $SVM has LS mirrors of the rootvol." "INFO: $SVM has an LSM volume on $DestLSMnode"
"INFO: $SVM does NOT have LS mirrors of the rootvol." "INFO: Created LSM volume for $SVM on $Node called $Vol"
"INFO: Created LSM mirror for $SVM and $RootVol to $Vol"
"INFO: Initialized snapmirror to $Vol"
It’s nice to be able to double-click and run, and this is very easy to do. Copy paste the below into a text editor and save as say SRLMC.bat. And below is an example of running this by double-clicking the SRLMC.bat file. In this example we have 3 NAS SVMs. 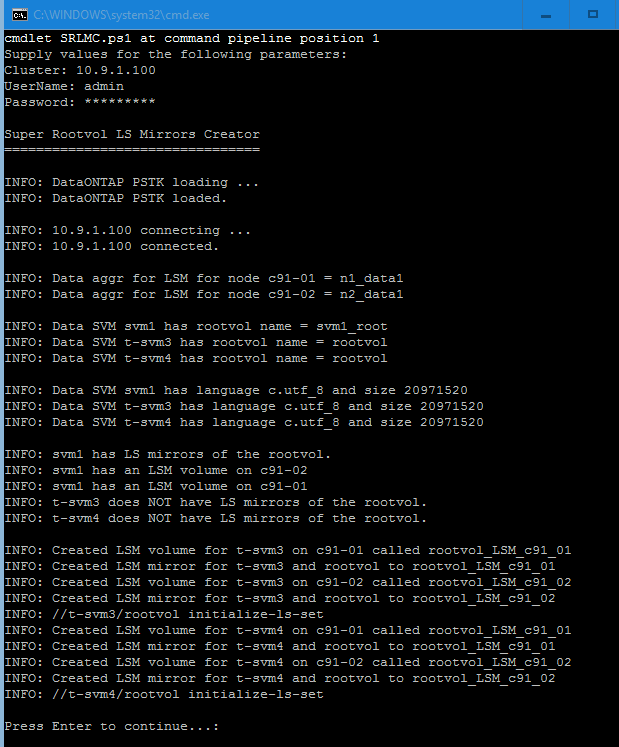 1 already has LSMs on both nodes, so SRLMC has nothing to do for that SVM. The other 2 need LSMs created on both nodes. Image: Super Rootvol LS Mirrors Creator in action! Note: This was tested with ONTAP 9.1.